An audio of me reading this prose poem can be heard by clicking the link below. It will take a few seconds for the sound to begin. It was the year we lived in London, some 25 years ago, when autumn began like any other autumn. The fall, the changing, the color shifting, the soft breezes, the sporadic thick fog and the leaves dancing, even floating upward at times. What I hadn’t anticipated, being so far north for the first time, was how short the days grew. How dark it became earlier and earlier all during that autumn. The days were ‘closing in.’ That’s what they called it, and I loved that phrase. It brought a certain comfort of pulling heavy curtains closed and shutting out the darkness. It was a time for wearing coats and warm sweaters, and I dressed my son in practical English clothing and soft grey mittens while he ran ahead enjoying what was left of the day. He was only three, but he knew the delight in using what was left of the day’s sunlight. I learned to enjoy the simple pleasures around me that came with this quiet season. Victoria plums were my new delight. They appeared at the Greengrocer’s shop just as autumn set in, later replaced by apples—Bramley and Cox’s Orange Pippins, names that twirled on the tongue and tasted as good. Burning leaves were an unexpected, half-loved sensory pleasure. The smoke was pungent, but it brought back memories of childhood. I loved even the rasp of raking, bamboo or metal combs gathering leaves in sacred piles waiting their turn to be sacrificed in an autumnal pyre. In the English light, I found the colors were softer, quieter than the brilliance of New England woodlands. Each morning I left my son at school and then walked through Hampstead Heath. I found my own favorite route through woods and meadows up to the large ponds. 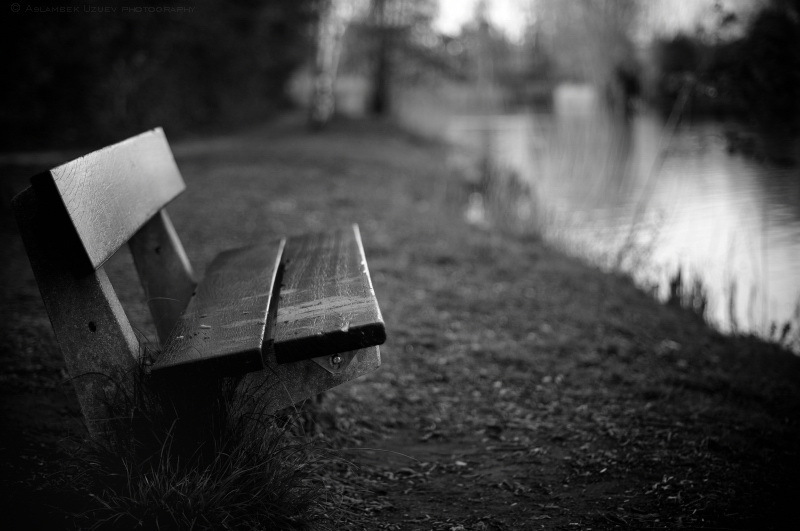 Purchasing a single cup of tea that warmed my hands, I made my way to that empty bench that faced the pond. I thought about all the people it had held before. And every day without fail a lone Scottish piper played his bagpipes as if on cue. Each day I sat and listened. A world so far from my own. From where he stood near the peak of Parliament Hill, the mournful songs became a wordless chanting, charging the air with a lamentation to this closing season, every day briefer, softer than the day before. This entry was posted in meditative poem, memories, memory, poem, Poems, poetry, Poetry and Photography, prose poems, seasons, Time and tagged autumn, autumnal, bagpipper, Hampstead Heath, Mary Kendall, meditation, memory, poetry, prose poem, reverie. Bookmark the permalink. I’ve never heard the term, “the days are closing in.” Describes fall days perfectly. Lovely, as always. Hugs. Thank you for sharing that memory with us.. Its amazing how a fragrance from the past can evoke so powerfully a memory that was lodged in the back our minds to be brought forward and relived..
You are so kind, Sue. I’m glad you liked this poem. Thanks for leaving a comment. That means a lot to me. Very evocative of the fall – my favourite season. Thank you for stopping by and reading some poems today. I so enjoyed reading this on a lovely fall afternoon in NC. It reminded me of fall days in my childhood, so lovely and peaceful and yet a little foreboding. Thanks for your thoughts on this poem, Patsy. Yes, I think autumn always has that ambiguity, doesn’t it? I read it with my eyes closed….imagining as I went. Lovely! Thank you, Susan. It’s lovely to know you could visualize so well. I probably will never go to London, but in your words I am there! I’m so glad the poem took you there. Thanks for reading it and taking the time to comment. JoAnna, thank you. You are a great travel companion. What a lovely vicarious experience! I could see, feel and even smell the environment described in your beautiful reminiscence-many thanks! This is one to read over and over! Why thank you, Sheppy. I’m so glad you liked the poem. Your writing transports me to the England autumn. My favorite line is, “I loved even the rasp of raking, bamboo or metal combs gathering leaves in sacred piles waiting their turn to be sacrificed in an autumnal pyre.” Wonderful rhythmn and imagery. I could see myself behind that bamboo rake. I wpnder what you were thinking on that nench. Why were you there that autumn day? I feel this is a beautiful beginning to an untold story. What in your life was closing in like the autumn days? Great wording and use sensory. You are a strong writer. Tina, your comments are so thoughtful. Thank you. I’m glad you liked this prose poem.